Please note that the content of this book primarily consists of articles available from Wikipedia or other free sources online. 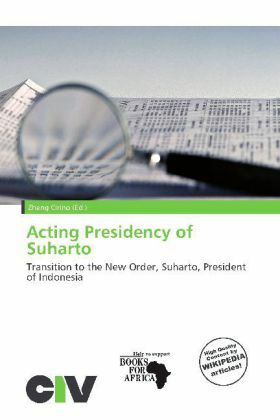 The Acting Presidency of Suharto followed the Transition to the New Order in which General Suharto was the President albeit on an interim basis. The term lasted from 12 March 1967 until 27 March 1968 when Suharto was officially elected as President of the Republic of Indonesia. By February 1967, President Sukarno realized that his political career was at an end and he became concerned at cutting his losses.